The design of this model with its clear reference to Chinese, specifically Manchu, prototypes, is given a context for its deviation from authentic examples. By titling the model ‘Steppe,’ Poiret alluded to the geographic perimeters of China, where the conventions of dress began to mutate through the contact with other cultures. 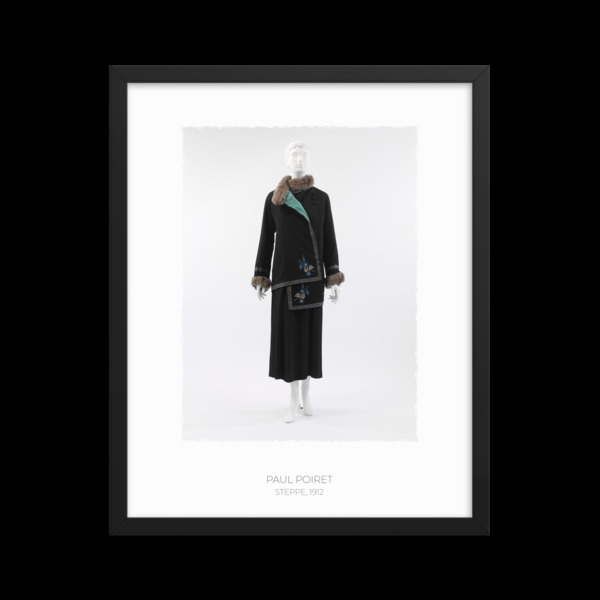 As with his citations of Near and Middle Eastern costumes, Poiret combined a series of small, evocative details to suggest the foreign. While his ‘Révérend’ coat of 1905 (now in the collection of the Galleria, Paris) was cut like a Taoist robe and had shou-like pictograms embroidered on its revers, references to the Far East appeared with less regularity in his collections than Islamic and Hindu citations. Here, the specific signs of Chinese dress are the asymmetric closure, the high collar, the blue and white morning glory embroidered motifs, and the decoratively stitched band edging. Documentary black-and-white photographs of the jacket imply that it was reproduced in 1924 and again in 1926. In the latter, it was worn with a lighter colored dress, possibly in the blue of the embroidery or in the gray of the jacket's fox trim. While it is likely that the ensemble was coordinated in color in Poiret's earlier prototype, he secreted a brilliant flash of turquoise silk as the lining. In 1911, Poiret employed almost the exact same color to line his blue black and white Dufy printed coat, ‘La Perse.’ Although it is likely that such an unexpected introduction of color should be ascribed to the designer, this jacket, as in the case of the Dufy coat, belonged to his wife, Denise. There is the possibility, therefore, that the lining is a manifestation of Denise Poiret's equally exuberant sensibility.